Oil India Limited is recruiting for the post of Programmers for the year of 2015, location at Noida. 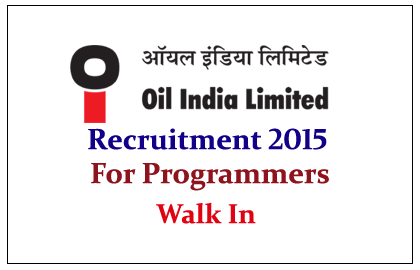 Eligible candidate can attend Walk-In on 20th June 2015. Oil India Limited (OIL) is the second largest hydrocarbon exploration & production (E&P) Indian public sector company and operational headquarters in Duliajan, Assam, India under the administrative control of the Ministry of Petroleum and Natural Gas of the Government of India. Rs.45000-/ per Month plus Rs.3500/- as accommodation allowance.